Sign Up to our offers newsletter! 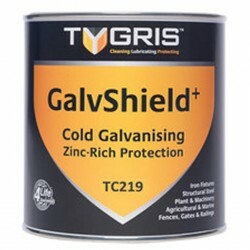 TYGRIS GalvShield+ is a single component, zinc-rich cold galvanizing protective coating suitable for use as a self-finish, or as a primer in a duplex system. Designed to protect all ferrous metals and prevent ‘rust creep’, TYGRIS GalvShield+ can be brush or spray applied and is ideal for use as a touch-up to damaged galvanised surfaces, or where hot dip galvanising is either impractical or cost-prohibitive. To order Tygris Galvshield please select the required product option below or call us on 01933 626225. Select an option below to add Tygris Galvshield to your shopping cart..
One of the leading industrial paint and epoxy suppliers in the UK, offering key epoxies for the repair and renovation of factory/ warehouse floors. Established since 1995, we have been advising and supplying specialised floor repair and paints to industry, leisure and logistics companies throughout the UK. As a family run business, we value every customer and their needs, and pride ourselves on being able to offer friendly, expert advice to every customer no matter their business size or spend. Disclaimer: Product packaging as displayed in the photos may vary from the actual item. Is spring too early to maintain that floor? Warmer weather allows a quick fix. Why you should fix that cracked concrete. Copyright © 2008 Fastaim Ltd trading as Janerol Supplies.